This page may be out of date. Check my personal website: Floris van Breugel’s scientific research. I study biological questions that tie together ecology, biomechanics, and neurobiology into engaging narratives of natural history. At the intersection of these topics is animal behavior, and with insects comprising over a third of all animal biomass, I have made them my focus. Of particular interest to me are the fruit fly and mosquito. Fruit flies have co-habited with humans throughout our evolution, and have developed a strong desire for alcohol thanks to our addiction to brewing it. Meanwhile, mosquitoes have forever plagued humanity as vectors of disease including Malaria, Dengue and Yellow Fever, and most recently, Zika. My research is focused on understanding the details of how insects can be so efficient at finding our fermenting fruit, and ourselves, despite their numerically limited brains. To answer these questions I build novel systems for automatic observation of insects in virtual worlds with computer controlled visual, olfactory, and thermal stimuli. Because both flies and mosquitoes are genetic model systems, I am also able to take advantage of sophisticated genetic tools to determine where in the brain their behaviors are controlled. This unique convergence of techniques allows me to bring together ecology and neurobiology in my research. Long distance migration of Drosophila melanogaster. Thirty years ago ecologist Jerry Coyne and collaborators demonstrated that flies are capable of flying over 10km; I am working on replicating these results with technologically advanced traps to find out how. Work in progress. Right: Fly trap, equipped with multiple illuminated odor sources and trapping chambers, and a time lapse camera to record the time of arrival of insects. Optimal search with unreliable cues. How animals optimally utilize unreliable sensory information is not well understood. 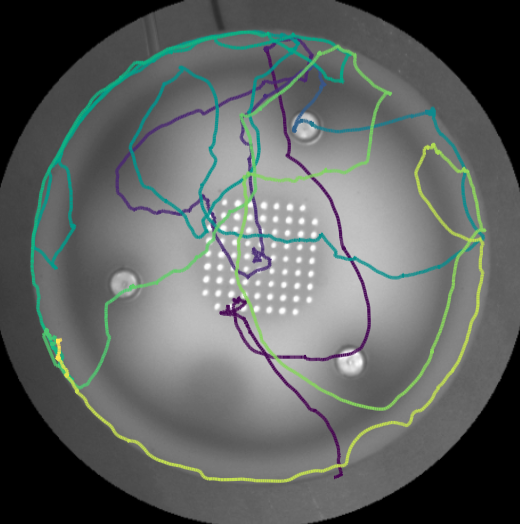 I am working towards understanding how fruit flies solve this problem by studying their free flight and walking behavior in response to different odors associated with fermenting fruit, and combining the resulting data with models to compare my results to existing theories on optimal foraging strategies. Work in progress. Above: Trajectory of a fly searching around an odor source for food. Color encodes time, starting at yellow and ending at purple. Alkali fly, safely underwater in Mono Lake, CA, in a protective air bubble. Diving Flies of Mono Lake. 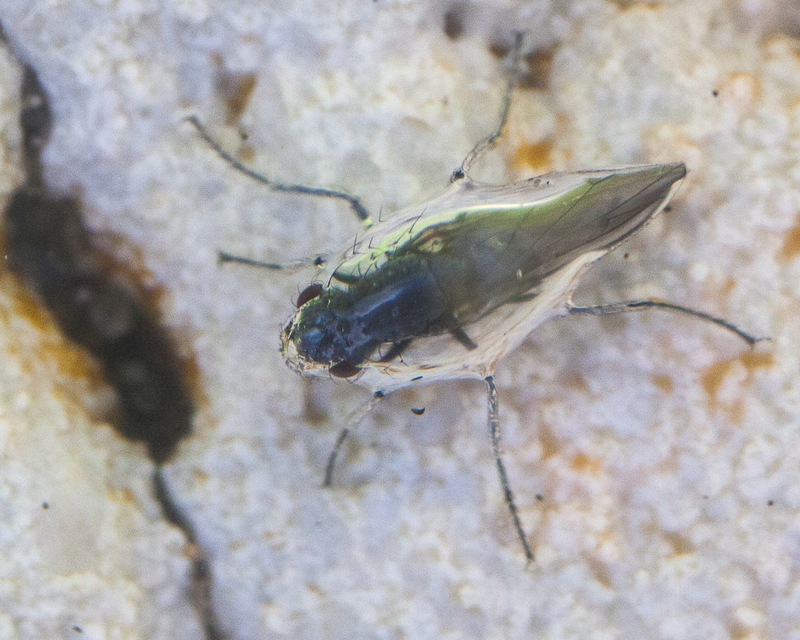 In late summer, the shores of Mono Lake, California, are bustling with small flies, Ephydra hians, which dive under water inside small air bubbles to feed. Despite Mark Twain’s charismatic description of them in his book Roughing It, we still do not understand how they are able to perform this entertaining and miraculous feat. Using a combination of high speed videography, force measurements, scanning electron microscopy, and manipulations of water chemistry I am working towards understanding what makes these flies so unique. See this recent press article for a more detailed description: Fly makes air ‘submarine’ to survive deadly lake (Science, 2016). Working progress. 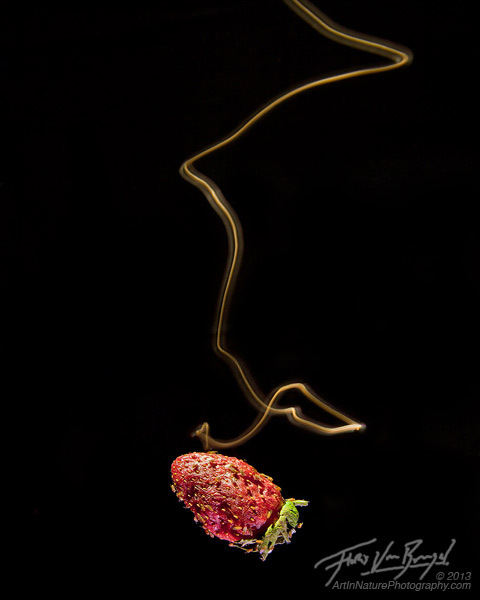 A long exposure of a fruit fly illuminated by a shaft of light as the fly approaches a fermenting strawberry in a wind tunnel. Odor Plume Tracking. When flies, mosquitoes, and other insects encounter an attractive odor, they turn upwind. Because odor plumes are broken apart by turbulent flows, the insect invariably exits the plume, sometimes after just a few milliseconds. This triggers zigzagging back and forth, until they re-encounter the odor plume. This strategy generally leads them close to the odor source, however, visual and other cues are necessary for the final stage of search. Read more about how flies use odors, and how mosquitoes integrate multiple sensory modalities. van Breugel, F., Riffell, J., Fairhall, A., and Dickinson, M. H. Mosquitoes use vision to associate odor plumes with thermal targets.(2015). Current Biology. 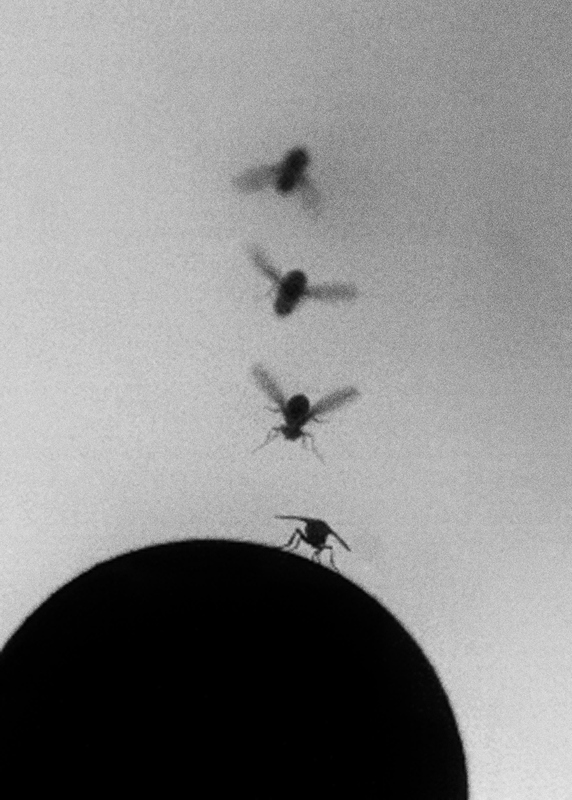 van Breugel, F. and Dickinson, M. H. Plume-Tracking behavior of flying Drosophila emerges from a set of distinct sensory-motor reflexes. (2014). Current Biology. Research hardware. I build most of my own behavioral arenas and write my own software to run experiments on freely behaving insects. 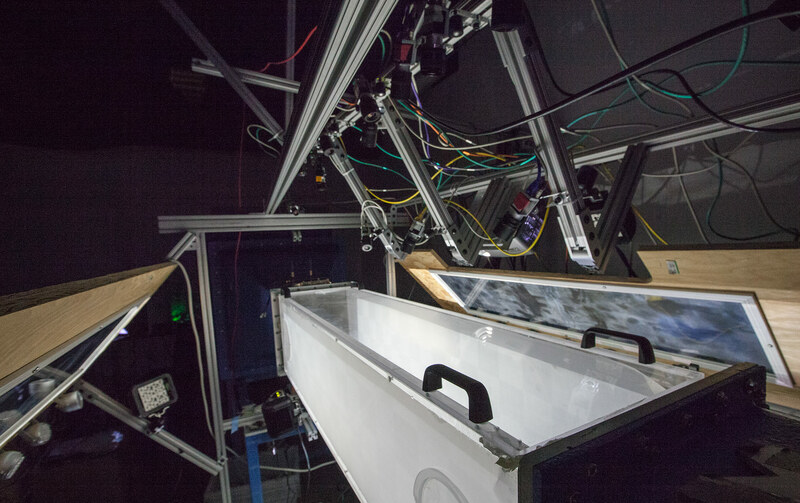 Left: Wind tunnel equipped with 13 cameras for automated 3D tracking of flying insects, and a projector for displaying dynamic visual stimuli. Combing these two features makes it possible to put flying insects in virtual worlds, and observe their responses. Working with Drosophila melanogaster, a genetic model system, makes it possible to use genetic tools to probe which neural circuits are responsible for controlling different behaviors. Optogenetic tools, such as red shifted channel rhodopsin (e.g. Chrimson), allow me to use these tools on freely behaving animals. 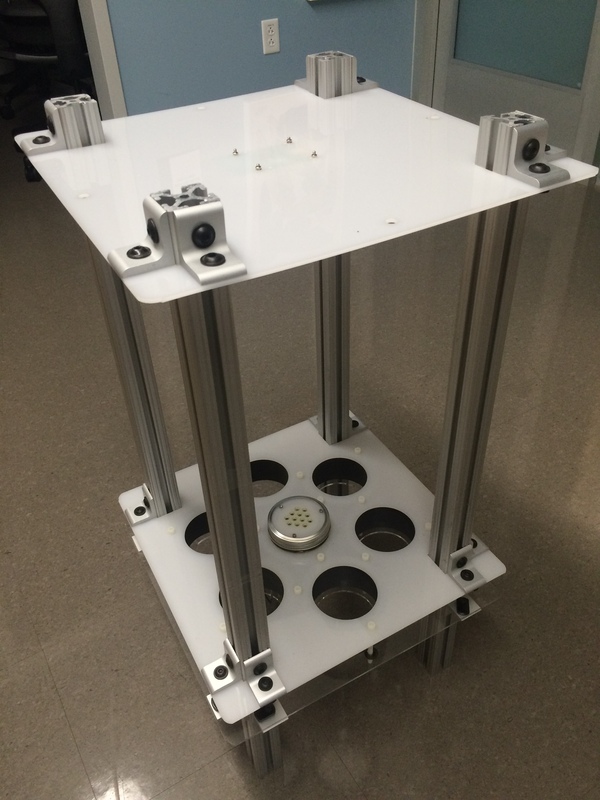 This approach makes it possible to bring together ecology and neurobiology in the laboratory. Right: Arena to examine the behavior of walking flies in response to different odors. The black cylinders are red LED’s for optogenetic activation of neurons. Software. To collect data on walking flies, I wrote my own 2D real-time multi-target tracking package. This software makes it possible to record video, and trajectories, of flies over the long periods of time – 24 hours or more. It is open source, and available at: http://florisvb.github.io/multi_tracker/. FigureFirst. Two of my colleagues and I are actively working on a software package to make the design of scientific data figures easy, fun, and dynamic. Our open source software package bridges the gap between existing GUI programs, like Inkscape, and python plotting libraries, like MatPlotLib. More info: http://flyranch.github.io/figurefirst/. Visual control of flight and landing using optic flow. 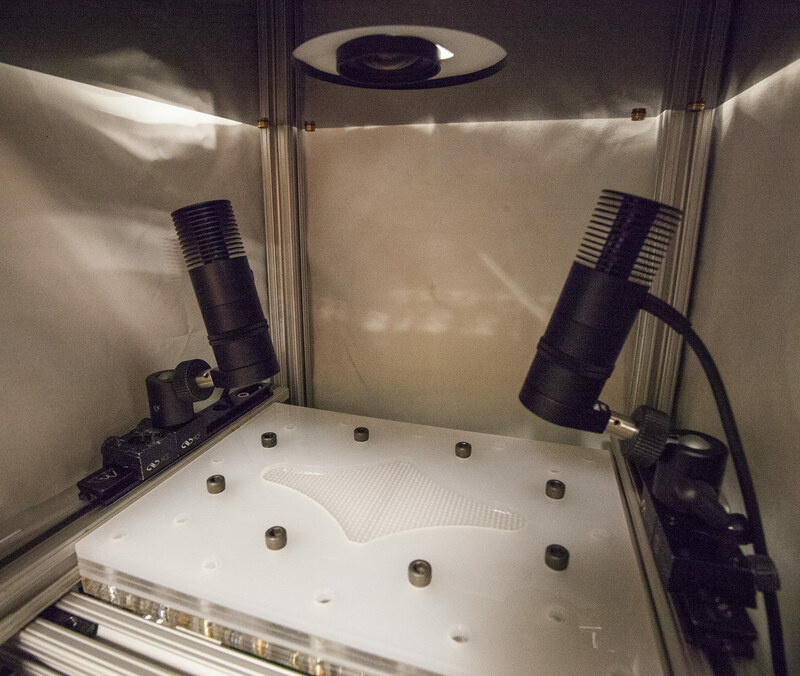 Using 3D tracking, closed loop control of high speed cameras, and genetic tools, I explored landing and the neural basis for flight speed control of Drosophila in free flight. Inspired by my results, I developed a novel algorithm for distance estimation from a single camera using nonlinear control theory. 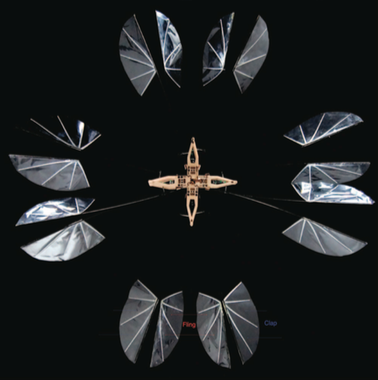 Bioinspired design of flapping hovering MAV’s. As an undergraduate, I used genetic algorithms and simulations to design wing stroke patterns for flapping flight. Subsequently, I built physical flapping systems, culminating in the first passively stable flapping hovering machine (left).